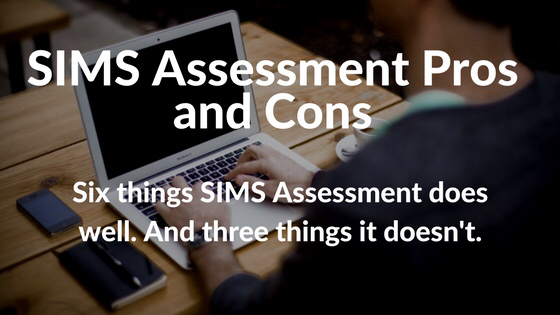 Last week someone asked me to summarise what SIMS assessment does well and what it doesn’t. I’m aware that SIMS can be a bit like marmite for many people – they love it or hate it. Here’s an honest review of SIMS pros and cons (with thanks to Gary Skelton who added to my original list of seven with an extra six excellent reasons of his own. Gary’s suggestions are in italics). Enter data and analyse it immediately. Ordinary SIMS data entry marksheets provide a very powerful way of analysing data. Class teachers can enter and analyse their own data. This encourages better ownership of data by class teachers. Some other products require teachers to enter data, the data is whisked off to another program where senior managers analyse it, then the analysis is simply presented to class teachers. SIMS encourages class teachers to enter and analyse their own data. No extra cost. SIMS Assessment and SIMS Discover are part of the SIMS core licence. Built in analysis for EYFS, KS1 and KS2. Over the past 12 months Capita have released some pre-configured reports that take your statutory data and provide deep analysis. A common skill set. Most schools run SIMS and the interface is familiar, even for new staff. Summative or formative (or both). SIMS has an extensive new system for recording formative assessments (the Programme of Study marksheets). The old-fashioned marksheets that have been part of SIMS assessment for years are still very good at summative assessments (and see my comments about flexibility above). Assessment knows what each grade is worth (and this can be changed easily) – a pain in something like Excel. Reporting (Profiles and Individual) – beats a mailmerge any day. Out of the box functionality is limited. It needs configuring first and hence schools can incur extra costs to buy in expertise from outside the school. Assessment can be slow on big marksheets. Do you agree? Want to add any? Leave a comment below. Easy to export data to Excel, for those that must, or for advanced manipulation. Relatively easy to reimport data (^), or pull in external assessment data and link to students. Ability to import config from another school / user. Teachers can’t easily create their own data collections or data types. Thanks Vik – all good points!